Here are tips to improve your sight reading! Learning how to read piano music does not automatically make you a good sight reader, and sight reading a piece well does not mean you have actually learned to play it. Eh?? So how can this be? Sight reading can be compared with skimming through a book. It gives you the general idea of a story, understood (performed) more or less well, but you have not yet studied the book. Learning a piece well, however, means you have to go deeper; you need to study the book, and give it more work and time in analyzing it and even to memorize it. 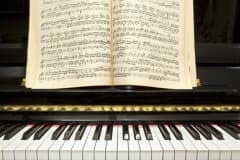 A pianist needs to learn both how to read piano music and techniques for music sight reading. The easier it is for you to sight read, the more you are able to try out pieces, and play from a piano book or sheet music as if you were reading loud from a book. And ultimately, the more fun you will have being able to test an unlimited amount of repertoire! With some stubborn effort from your side, and by setting aside a few minutes a day, you can learn to sight read notes well. For some people it might come very easy- and yes, it is true, some people just naturally are able to decode and extremely quickly translate note patterns to movements (which is how sight reading works). 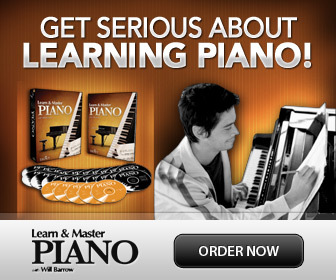 For most though, learning how to sight read piano music is a skill that needs to be practiced. You get a great bonus in the process – it is very good for your brain- a real “brain-gym”! As a beginner pianist you are just starting to learn how to read notes as you work on your first pieces, so the real sight reading practice can wait a bit. When you you have reached the level where you can play both hands at the same time - the time has come for extra sight reading practice. So, how do you practice sight-reading? To quickly learn sight reading you need to choose very easy small pieces and then gradually increase the difficulty. The easiest way to do so is to use one of many sight-reading books available. This is absolutely the most time effective since you don’t have to waste time trying to find pieces at the appropriate level. You also need to learn how to not look down at your hands when you play, and keep your eyes moving forward in the music. Sight reading is a lot about learning to "discipline" your eye movements so that you "lead" your hands and fingers to perform the correct movements not by looking at them. Preferably, use a sight reading method, like Sight Reading & Rhythm Every Day, Book 1A a method to practice music sight reading that I really recommend and have used very successfully with my students. Bartok's Mikrokosmos Volume 1 (Pink) is also good for sight-reading practice, starting with book 1. Otherwise, just use very easy, short pieces at least 2 levels under your own. Set aside 5 min. a day. Prepare: Before actually playing each exercise, play on top of the keys without pressing them down. Play on top of the keys like this through the whole piece. This helps to prepare your “inner ear” and makes it easier to play. Count the rhythm: Count the rhythm as you prepare, also when playing "on top of" the keys. Block (play the two notes together) any intervals larger than a second. It helps your muscle memory. Don't think! When you sight read, you can’t really think as you play. You have to train yourself to just move along- and not to stop or replay a wrong note. Use easy music. If a piece you sight read has too many mistakes- it is not simple or short enough. I tell my students that one mistake is OK, two is not OK- then you need an easier piece, or to play slower, or both. Don't look at your hands. Force yourself not to look at you hands when you sight read. You simply do not have the time! Look ahead: You have to always look a few notes ahead from the ones you are playing, and just go, go, go! Just do it. And keep on doing it! If you use one of the books I suggested, follow all the instructions, and after the first three books with only a few minutes a day, you will notice a huge improvement in how you can sight-read piano music as you play! Learning music sight reading can be a lot of fun! Remember that the more fun you (and your brain) have, the easier you learn how to read piano music and sight read! Learn how to use a metronome and start by playing extremely easy pieces with a metronome on slow speed- as slow as you need to play all without mistakes- and then gradually increase the speed. Playing super easy duets, or together with play-along CD’s is also great, and fun, to train your eyes to constantly move forward in the notes, and not to linger anywhere, as you are pushed forward by the music and you have to follow somebody else! If you have a keyboard with different drum style accompaniments- it is also a fun alternative to play along with a piece instead of a metronome- go wild with the wrong style, like Bach’s G major minuet with jazz waltz accompaniment!